(Newser) – "I called [my employer] and told them I will not be coming back," Fox News quotes Mavis Wanczyk as saying after claiming her massive $758.7 million Powerball jackpot on Thursday. USA Today reports it's the largest grand prize won with a single lottery ticket in US history. 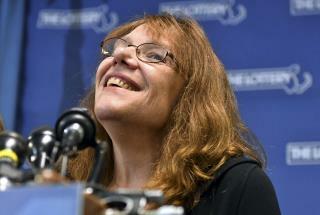 The 53-year-old hospital worker from Massachusetts says her "pipe dream came true." She bought the winning ticket Wednesday at a store in Chicopee and heard she was a winner while leaving work Wednesday night, according to CBS News. "I just want to sit back and relax," Wanczyk says. "I wanted to retire, and it came early." The executive director of the Massachusetts lottery calls Wanczyk "a prototypical Massachusetts resident ... someone who's a hard-working individual." She'll be spending it all on crack. Only white folks hit the lotto!